Periodontal (gum) disease is a bacterial infection, which if left untreated could cause gum recession, bone loss and eventually tooth loss. Caused mainly by plaque left on tooth surfaces from poor hygiene practices, the deeper the infection spreads below the gum line, the more difficult it is to treat. One possible scenario involves parts of a tooth’s root structure known as furcations. These are branching forks formed during the early development of teeth with multiple roots where they take different paths from the base of the crown. As gum disease spreads around the root it may cause different degrees of bone loss at the point of the branch. 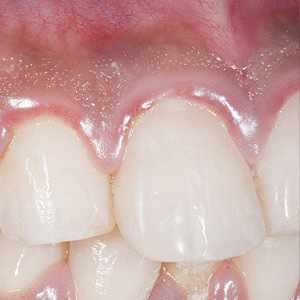 It’s imperative when treating gum disease to uncover and remove any bacterial plaque or calculus (hardened plaque deposits) found, including below the gum line. To address bacterial plaque at the root level, it’s important to first determine if bone loss has involved the furcations (where the roots separate, also referred to as a “furcation invasion”) and to what degree. We usually classify this degree of involvement in three classes: Class I, the invasion has created a groove in the furcation, but minimal significant bone loss; Class II, the bone loss has extended into the furcation by at least two millimeters; or Class III, the bone loss extends completely from one end of the furcation to the other (or “through and through”). Depending on the class, cleaning plaque and calculus from furcations and then maintaining them thereafter can be quite challenging. We may need to use specially shaped hand instruments known as scalers or curettes to reach and clean root surfaces, or ultrasonic scalers that use high-frequency vibrations and streaming water to loosen and flush away plaque debris. It may also prove helpful, though limited, to apply antimicrobials or antibiotics to the area to help limit the levels of bacteria. Disease damage around furcations may also require surgical treatment to encourage new tissue and bone growth in the area. Surgery can also help make the area more accessible to future cleaning and maintenance, both for you and us. Renewed hygiene practices on your part and regular cleaning and checkups with us will help ensure that the situation involving your tooth roots can be kept under control and your tooth preserved for many years to come. If you would like more information on treatments for gum disease, please contact us or schedule an appointment for a consultation.